Texas lawmakers didn’t comply with the Voting Rights Act when they drew new maps for congressional, state Senate and state House districts, a federal court in Washington, D.C., ruled Tuesday. Attorney General Greg Abbott immediately said — via Twitter — that the state will appeal the ruling to the U.S. Supreme Court. "Today's decision extends the Voting Rights Act beyond the limits intended by Congress and beyond the boundaries imposed by the Constitution," he said a few minutes later in a press release. "The Attorney General's Office will continue defending the maps enacted by the Texas Legislature and will immediately take steps to appeal this flawed decision to the U.S. Supreme Court. 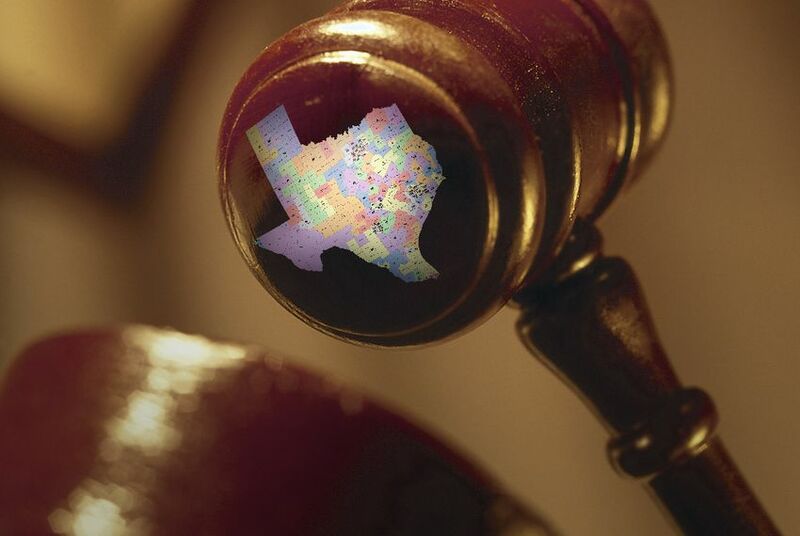 The Washington, D.C., court's decision applies to the maps originally enacted by the Texas Legislature — so the November elections will proceed as planned under the interim maps drawn by the federal court in San Antonio." The court wasn’t ruling on interim maps drawn by federal judges — the maps in use for the current election — but on those drawn by state lawmakers last year. Lawyers are still looking through the opinions for anything that might disrupt the current elections. Nina Perales, litigation director for MALDEF — the Mexican American Legal Defense and Education Fund — said there might not be time to draw new maps before the November elections even if they're warranted. One question is whether problems exposed in the plans drawn by legislators "infected" the plans drawn by the federal judges in San Antonio. "I don't think it's feasible to change the lines for November," she said. Perales called the federal court ruling "the final nail in the coffin" for the plans drawn by state lawmakers, especially since the San Antonio judges outlined several other legal problems with those same maps earlier this year. The outcome of Abbott's appeal and the analyses being done by the various parties in the redistricting legislation will determine which lines, if any, get redrawn before the 2014 elections. Some have made up their minds. "The question of whether we’ll go back to the district court and ask for additional relief, the answer is yes," said Jose Garza, attorney for the Mexican American Legislative Caucus. "Will we ask if this will be implemented for the November elections? We're still analyzing that." Texas and other states with histories of discrimination have to have federal approval for any changes in voting laws and political maps. Instead of going to the U.S. Department of Justice for that "preclearance," Abbott's office opted to ask the federal court in D.C. That court has had the maps in hand for months — its hearings began last November; while it was working on a decision, another federal court, meeting in San Antonio, put its own redistricting maps in place. Those court-drawn maps are being used in the current elections while those drawn by the Legislature are still tangled in appeals. That section of the voting law is designed to keep new maps from eroding the ability of minority voters to elect candidates of their choice. The court singled out problems in congressional districts 23 and 27 and in several state House districts. The court decided crossover districts and coalition districts — those in which a racial majority has to rely on votes from other groups to win — are protected, according to the attorney general’s staff. The Supreme Court has never done that, and that finding is part of their objection to Tuesday’s decision. Daniel Hodge, the state’s first assistant attorney general, said the standard used by the court to decide whether minority districts were protected is unconstitutionally vague, making it impossible for a state legislature to parse the ruling and meet that standard. What’s more, he says, this part of federal voting law is supposed to be used to decide whether a state eroded existing minority voting rights — not whether a state should have created new ones to meet population growth, as the D.C. court appeared to do in this ruling. The state also maintains that the interim maps adopted by federal judges in San Antonio take care of all of the problems delineated in the ruling. The maps in use now, Hodge argues, satisfy the objections raised by the judges about the maps drawn by the Legislature. Other parties take issue with many of those points; several said on Tuesday that the maps in use now will probably be litigated or redrawn in light of Tuesday’s ruling. That might happen after the November elections, but the battle over the political maps doesn’t appear to be over. "Today is a victory for the people of Texas. I am thankful that this federal court has preserved the integrity of 'one man, one vote' by enforcing the Voting Rights Act. The Republican-drawn maps were a prime example of why Texas maps must be precleared in the first place: the maps did not represent the demographics of our state and blatantly disenfranchised minority voters. While this does not affect the current maps for November’s election, today’s opinion ensures that we are one step closer to having maps that allow voters to elect representatives of their choice. I was called as a witness by the U.S. Department of Justice in this case, and I would like to thank Attorney General Eric Holder and his staff for their vigorous defense of the Voting Rights Act and their stellar performance in federal court." “I am pleased with the court's decision, especially knowing that this court has agreed that those in charge in Austin were neither honest nor transparent with Texans during their overly partisan and discriminatory redistricting process. I am proud to stand up for Senate District 10 voters on this issue and will continue to fight for them on their priorities such as education funding, job creation, and affordable college tuition." "The ruling affirms what we have continuously held true and central to the Voting Rights Act, which is that we will no longer roll over and let others dismantle the core of African American districts. The rights of all communities must be respected. I look forward to the opportunity for the Texas Legislative Black Caucus to rectify the harms done and have an honest, open and meaningful redistricting process next Session, as the Federal Court justices have demanded." "Today's ruling by a federal three-judge panel adds yet another layer of proof to Democrats' contention all along that Texas went too far in redrawing Congressional, Senate and state House maps during last year's legislative session. The court ruled that the maps in fact violate the federal Voting Rights Act. The state in this regard had to prove that the maps as passed by the Legislature would not discriminate by limiting the ability of minority voters to elect a candidate of their choosing. They failed. So futile was their case that the state's lawyers attempted to shift the longstanding burden of proof from the state, to the Justice Department (DOJ) and the defendants. The court also said no to this argument. This ruling comes with just over two months remaining before the November 6 elections where some have stated their willingness to do whatever it takes to make President Barack Obama "a one-term president." That willingness, in addition to redrawing state and congressional maps in a manner ruled discriminatory by the DOJ and now the courts, also extends to passing Voter ID laws across the country that will further suppress the will of those who disagree with their efforts to turn back the clock, from having their voices heard at the polls. Today's ruling is also a victory for my North Texas colleague Senator Wendy Davis, Democratic Congressional District 33 nominee Marc Veasey, and friends from the Texas NAACP, MALDEF and LULAC who fought the Republican maps tooth and nail from Austin and San Antonio all the way to Washington."